This spring the V&A will present the only major retrospective in Europe of the work of the visionary fashion designer Lee Alexander McQueen. 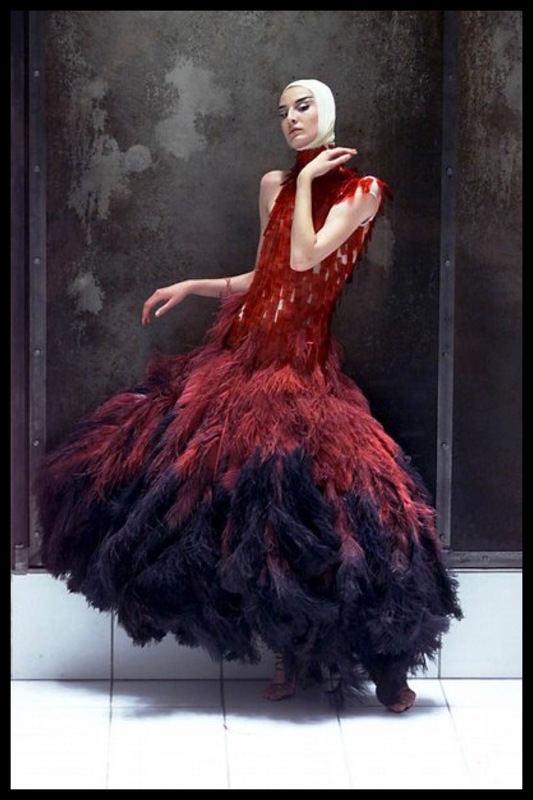 One of the most innovative designers of his generation, McQueen was celebrated for his extraordinary creative talent. He combined a profound grasp of tailoring and eclectic range of influences with a relentless pursuit to challenge the boundaries of art and fashion, blending the latest technology with traditional craftsmanship. Gainsbury and Whiting, the production company that collaborated with Alexander McQueen in staging his catwalk shows are working with the V&A on the exhibition. Each section will capture the essence of the provocative, dramatic and extravagant catwalk presentations that McQueen became renowned for, combining storytelling, theatrical performance, music and film. For example the spectacular moment where Kate Moss appeared in a gown of rippling organza as a holographic 3D image will be shown near life size as it was for the finale of the Widows of Culloden (A/W 2006-7) catwalk show. In total, the exhibition will showcase more than 200 ensembles and accessories, the largest number of individual pieces designed by McQueen and collaborators ever seen together. They range from McQueen’s Central Saint Martins’ postgraduate collection of 1992 to his final designs for A/W 2010, completed after his death, and are drawn primarily from the Alexander McQueen archive in London. The V&A was one of the first museums to show McQueen’s work in 1997 in the exhibition Cutting Edge: 50 Years of British Fashion 1947-1997. He was also represented in the Fashion in Motion series in 1999 and with Shaun Leane in 2001, and was one of 11 designers represented in the exhibition Radical Fashion in 2001 which showcased works from his Voss collection (S/S 2001). The V&A’s presentation of the exhibition is being made possible with the cooperation of Alexander McQueen and will be in partnership with Swarovski, and supported by American Express.